A number of materials are available to the rhinoplastic surgeon to augment the nose. These include alloplasts (synthetic implants), allogenous materials (obtained from cadavers), or autologous implants (harvested from the patient's own tissue). Each has advantages and disadvantages; these are discussed in this article. See the images below. Young boy with bilateral cleft lip and palate who also has midface hypoplasia and requires nasal augmentation. 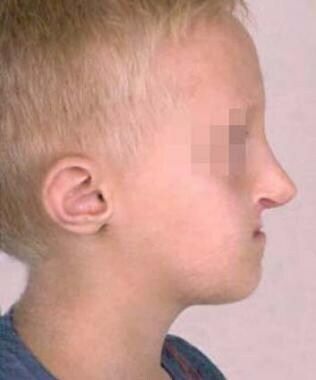 Young boy (same patient as in the image above) with bilateral cleft lip and palate who also had midface hypoplasia and required nasal augmentation, shown after dorsal nasal augmentation was accomplished using autologous rib grafts. It was fashioned slightly larger than needed to account for the patient's future facial growth. Throughout the 19th century, various alloplastic materials (as well as autologous bone grafts) were used for nasal reconstruction; however, autologous bone was used most commonly. In 1907, Jacques Joseph described the use of autologous cartilage inserted as a free graft through an endonasal incision. In 1941, Peer described the ability of autologous septal and auricular cartilage to resist resorption. Over the ensuing decades, a variety of grafts for augmentation of the dorsum and tip have been described. In 1985, Tardy described 2000 cases of augmentation rhinoplasty performed by using cartilage (septum, pinna, and rib), with low resorption and complication rates. In recent decades, a vast array of alloplasts for nasal augmentation has been described. The most common deformities requiring augmentation include a lack of projection of the dorsum and/or tip. Augmentation may also be required to fill defects or camouflage irregularities of the nasal sidewalls. Nasal valve collapse is among the more common functional deficits requiring augmentation. This collapse may be treated with a number of cartilage grafts, including alar batten grafts and spreader grafts. The indications for augmentation are multiple and include congenital defects, defects secondary to systemic disease (ie, Wegener granulomatosis), posttraumatic defects, and postsurgical defects due to excessive reduction rhinoplasty or after tumor ablative surgery. The appropriate selection of graft material is one of the initial and most critical decisions in augmentation rhinoplasty. The multitude of graft options may appear to rival the number of rhinoplasty surgeons. The host is tolerant of the material, without an immunologic reaction. The shape and size of material is stable over time. The material is reasonably malleable to carve or mold into the desired shape. The material does not cause discoloration or transillumination of the intervening tissue. The material is easily obtainable. An adequate supply of the material is available. Many surgeons prefer to use autologous tissue whenever possible, and some evidence suggests a lower incidence of infection when the patient's own tissue is used. Autologous materials have the potential to be incorporated into the host tissue bed, offering stability, as well as resistance to infection and extrusion over time. Autologous materials are also believed to have the unique ability to adapt to the host bed. Thus, a graft consisting of cartilage tends to fix well to cartilage, and bone tends to fix well to bone. Autologous materials used include cartilage and bone; examples include septal, auricular, and costal cartilages as well as costal or calvarial bone. See the images below. Woman with a subtype of midline granulomatous disease that caused nasal collapse. Augmentation was required. Woman (same patient as in image above) with a subtype of midline granulomatous disease that caused nasal collapse, shown after augmentation with both autologous rib and cartilage grafts. AlloDerm was also used for additional augmentation. One of the advantages of septal cartilage is the ease of harvest from the surgical field. Septal cartilage tends to be well suited for augmentation because it retains its shape well with minimal warping. A relative disadvantage is that an adequate amount of septal cartilage is often not available for moderate-to-severe augmentation in patients who have undergone previous septorhinoplasty. This shortcoming is due to resection of septal cartilage at the time of previous surgery or the resorption of the residual septal cartilage over time. In some cases, the amount of augmentation material required simply exceeds the available cartilage despite the presence of a normal native septum. Auricular cartilage is easily harvested and generally sufficient for mild-to-moderate augmentation. However, auricular cartilage has a tendency to warp or crack, with efforts to soften or crush the edges. This donor cartilage can also be difficult to use in persons who need a straight graft (eg, columellar strut). When the available septal and auricular cartilage is inadequate for the planned augmentation, a rib graft is an excellent choice. Autologous bone may also be used. Bone from the iliac crest, calvaria, rib, tibia, and ulna have been used. The advantages include the abundant bone available and its resistance to warping. Some believe that endochondral bone sources, such as the rib, iliac crest, and tibia, have greater resorption rates than those of membranous bone such as calvaria. Furthermore, the donor sites are typically outside the primary surgical field and are often associated with relatively greater morbidity. Compared with cartilage grafts, autologous bone grafts have a greater tendency to feel unnatural, with sharp edges occasionally showing through as the skin retracts over time. Use of bone for augmentation in the lower third of the nose appears particularly unnatural because of its rigidity. Other autologous materials have been used. Use of the temporalis fascia, either alone or wrapped around cartilage to soften the edges, has been advocated. A series of 25 consecutive Asian patients who underwent dorsal augmentation with diced cartilage wrapped in temporalis fascia had no evidence of resorption with 6-years follow-up. Use of the pericranium for smaller defects has also been described. Allogenous grafting essentially refers to irradiated rib. This is advantageous because of the large amount of material available for significant augmentation without donor-site morbidity. Resorption, warping, and infection can occur as with other materials. Some concern about the possible transmission of infectious disease exists. For many patients and physicians, this concern makes the choice of this material unappealing. The most commonly used allograft materials include silicone, polytetrafluoroethylene, and porous polyethylene. [7, 8, 9] Alloplastic materials have numerous advantages. They are readily available with an unlimited supply, they are easy to fashion into the desired shape, they resist warping and resorption, and they have no donor-site morbidity. For these reasons, alloplastic implants have many proponents. However, alloplastic implants have been noted to have higher rates of infection and extrusion. Infection of the implant may leave the patient with permanent damage to the overlying skin. Caution is advised in the use of synthetic implants in revisions and in situations in which a communication with the nasal cavity (eg, septal perforation) is present (see Contraindications). In these cases, the poorer vascularity, thinner soft-tissue envelope, and potential for contamination significantly increase the risks of infection and extrusion with alloplastic implantation. In Godin et al’s 10-year series utilizing Gore-Tex implants, they demonstrated a 5.4% incidence of infection inpatients undergoing primary rhinoplasty compared with 1.2% for primary cases. The upper third of the nose, with less mobility of the soft tissue and less proximity to the nasal lumen, may be somewhat safer for the introduction of synthetic implants. Some patients note skin changes (eg, erythema) with the introduction of synthetic implants. Porous polyethylene is somewhat unique because an ingrowth of tissue may develop, and this makes it more stable and less likely to become infected. A person with a congenital defect (uncommon) may have a relative lack of cartilage or bony structure. 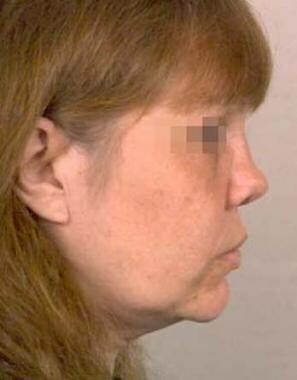 Some persons may have agenesis of 1 or more components of the bony and/or cartilaginous structure of the nose. Defects due to trauma and iatrogenic causes are more common. These defects result from a crushing injury to the structures of the nose or from septal hematoma, resulting in necrosis of the septum with subsequent collapse of support of the dorsum. If such injuries occur at an early age, they can cause scarring, which limits subsequent growth of the nose. Iatrogenic causes of defects include excessive removal of bone and cartilage at the time of rhinoplasty. These can result in a relative lack of projection and severe saddle-nose deformities. Rarely, infectious and inflammatory conditions such as sarcoidosis, relapsing polychondritis, or Wegener granulomatosis can destroy the support structures of the nose. Finally, neoplasms, including skin cancers that erode through the skin to disrupt the underlying structures, can require a reconstructive procedure and augmentation. Augmentation rhinoplasty may be indicated for functional concerns, aesthetic concerns, or both. The internal and external nasal valves affect nasal airway obstruction. Collapse of these areas in either a static or dynamic fashion often require the introduction of graft material to provide needed support of the nasal sidewalls. Patients who present for augmentation rhinoplasty may or may not be consciously aware of the need for augmentation. The desire for augmentation is particularly strong those patients with saddle-nose deformity or other such dramatic deficits. 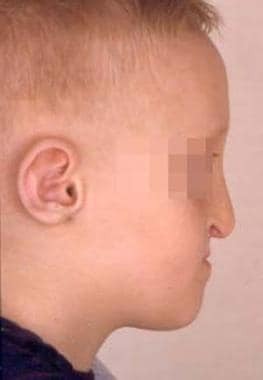 In other individuals, an asymmetry of the profile may produce a pseudohump, and the patient may believe that reduction is necessary. In such persons, careful nasal analysis reveals the need for augmentation to bring the dimensions of the nose into harmony with the rest of the face. These principles should be demonstrated to the patient to gain his or her acceptance of the surgical plan. Careful history taking to determine the nature of the problem is crucial to proper surgical planning. This process should include an inquiry about previous trauma or surgery and symptoms of nasal obstruction, as well as a clear discussion of the patient's objectives. On physical examination, the aesthetic value of the nasal dorsum must be critically evaluated. The frontal view is examined. Two slightly curved, divergent lines that extend from the medial supraciliary ridges to the tip-defining points outline the brow-tip aesthetic line of the dorsum. 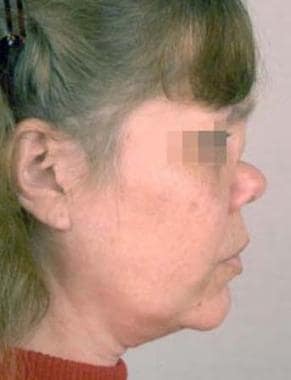 Alternatively, the authors and many others believe that a slightly wider dorsum should also be demonstrated in the middle third, with cephalic and caudal tapering, because this is a more natural appearance. The aesthetics of the profile must be analyzed critically. No single ideal profile exists, because each individual has his or her own tastes and priorities. However, some rules pertaining to the desirable components of a theoretic ideal are important in guiding the decision-making process of the surgeon. The nasion should be positioned at the level of the supratarsal crease. The forehead and glabella must be adequately projected to create an appropriately defined nasofrontal angle. A relatively straight dorsum with a slight convexity at the rhinion is most natural and pleasing. The tip should project slightly, with the supratip area composing the leading edge of the nasal profile. A gentle, convex columellar curve should have a slight break in the convexity from the tip defining point to the subnasion. The columella should be visible 2-4 mm below the alar margin, and the nasolabial angle should be greater than 95°. The physical examination must include an assessment of the internal nasal anatomy, any septal deviations or perforation, and the position and quality of the upper and lower lateral cartilages. The upper lateral cartilages may be displaced into a vertical position, abutting the septum. This is often observed as an inverted V deformity on frontal view, where the upper lateral cartilages have collapsed inferomedially. This appearance may also be caused by overresection of the bony dorsum with inadequate medialization of the nasal bones. On rare occasions, the upper lateral cartilages may actually become disarticulated from the nasal bones. Simple augmentation in a person with such a deformity without addressing the collapse in this region (eg, with spreader grafts) invariably leads to disappointing functional results in such patients who have nasal obstruction. The nasal bones must be palpated. The patient with short nasal bones (in which the bony pyramid is less than one third the distance from the nasofrontal angle to the septal angle) often has a narrow upper vault and bilateral concavities of the cartilaginous vault. Osteotomies may further impede the airway in such individuals, and spreader grafts often are required. A dorsal onlay graft may be necessary to widen the nose to improve the aesthetic result. To analyze the need for this augmentation, one may draw an imaginary line from just above the nasofrontal angle to the tip defining point. The dorsum of a woman should lie parallel and as far as 2 mm posterior to this line. If the dorsum is separated from this line by more than 2 mm, dorsal augmentation should be considered. The nasion should lie at the level of the supratarsal crease. If it is below this level, augmentation may be performed to raise the nasion. Other than dorsal augmentation, additional indications for augmentation of the nose exist. Functional improvement of nasal valve collapse is achieved with spreader or alar batten cartilage grafts. Underprojection of the tip requires structural grafting. Contour irregularities of the nasal tip may be corrected with cartilage grafts. The anatomy of the nose must be understood in detail to perform rhinoplasty safely and effectively, and augmentation is no exception. Some particular points of the anatomy warrant emphasis. The nasal airway is narrowest at the internal nasal valve, which consists of the region where the caudal end of the upper lateral cartilage meets the septum medially and the anterior end of the inferior turbinate laterally. Many patients requiring augmentation have undergone extensive surgery or trauma, and nasal obstruction is often present. This obstruction may narrow the middle vault by a number of mechanisms, including overresection of the dorsum or of the lateral crura, excessive narrowing with osteotomies, and loss of the naturally occurring increased width of the dorsal septum once excised. The traumatized or resected nasal bones may have resulted in destabilization of the upper lateral cartilages, resulting in inward collapse of the upper lateral cartilages, which are displaced to lie vertically, abutting the septum. The surgical plan should address this collapse. This may be accomplished with spreader grafts or onlay grafts placed in such a way as to spring open the nasal valve. The soft tissue envelope of the nose may limit the amount of improvement in projection. Many such patients have significant scarring, resulting in not only inflexibility of the soft tissues covering the structures of the nose but also a relative lack of vestibular lining. Overrotation of the tip in such patients is not uncommon. Examination including palpation can reveal this in the office. Such patients may require composite grafts to provide greater vestibular lining in addition to augmentation of the dorsum or tip. Relative contraindications exist for the type of implant used. Alloplasts such as polytetrafluoroethylene and silicone have a greater risk of infection and extrusion when previous surgery has been performed, as it often has been in these patients. In addition, any communication of the pocket for the graft and the internal nose increases the risk of infection, and one may consider the implantation of synthetic materials more hazardous in such instances. Graft material needs enough rigidity to support the surrounding soft tissues, which, for example, prevents the use of polytetrafluoroethylene in the lower third of the nose. Park SS. Fundamental principles in aesthetic rhinoplasty. Clin Exp Otorhinolaryngol. 2011 Jun. 4(2):55-66. [Medline]. [Full Text]. Wee JH, Park MH, Oh S, Jin HR. Complications associated with autologous rib cartilage use in rhinoplasty: a meta-analysis. JAMA Facial Plast Surg. 2015 Jan-Feb. 17 (1):49-55. [Medline]. Kim KK, Zhao L, Belafsky P, Patel PK, Strong EB. Technical note: "look-ahead" navigation method for K-wire fixation in rhinoplasty. Oral Surg Oral Med Oral Pathol Oral Radiol Endod. 2008 Feb. 105(2):168-72. [Medline]. Shipchandler TZ, Chung BJ, Alam DS. Saddle nose deformity reconstruction with a split calvarial bone L-shaped strut. Arch Facial Plast Surg. 2008 Sep-Oct. 10(5):305-11. [Medline]. Daniel RK. Diced cartilage grafts in rhinoplasty surgery: current techniques and applications. Plast Reconstr Surg. 2008 Dec. 122(6):1883-91. [Medline]. Tosun Z, Karabekmez FE, Keskin M, Duymaz A, Savaci N. Allogenous cartilage graft versus autogenous cartilage graft in augmentation rhinoplasty: a decade of clinical experience. Aesthetic Plast Surg. 2008 Mar. 32(2):252-60; discussion 261. [Medline]. Yap EC, Abubakar SS, Olveda MB. Expanded polytetrafluoroethylene as dorsal augmentation material in rhinoplasty on Southeast Asian noses: three-year experience. Arch Facial Plast Surg. 2011 Jul-Aug. 13(4):234-8. [Medline]. Gao F, Yin NB, Ji Y, Song T, Li HD. Alar cartilage used as tip grafts in secondary silicone augmentation rhinoplasty in Chinese patients. J Craniofac Surg. 2011 Mar. 22(2):614-6. [Medline]. Godin MS, Waldman SR, Johnson CM Jr. Nasal augmentation using Gore-Tex. A 10-year experience. Arch Facial Plast Surg. 1999 Apr-Jun. 1(2):118-21; discussion 122. [Medline]. Qian SY, Malata CM. Avoiding pitfalls in open augmentation rhinoplasty with autologous L-shaped costal cartilage strut grafts for saddle nose collapse due to autoimmune disease: the Cambridge experience. J Plast Reconstr Aesthet Surg. 2014 Aug. 67 (8):e195-203. [Medline]. Marin VP, Landecker A, Gunter JP. Harvesting rib cartilage grafts for secondary rhinoplasty. Plast Reconstr Surg. 2008 Apr. 121(4):1442-8. [Medline].